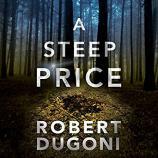 New York Times bestselling author Robert Dugoni’s thrilling series continues as Seattle homicide detective Tracy Crosswhite is plunged into a case of family secrets and murder. Solving the mystery behind the murder isn’t Tracy’s only challenge. The detective is keeping a secret of her own: she’s pregnant. And now her biggest fear seems to be coming true when a new detective arrives to replace her. Meanwhile, Tracy’s colleague, Vic Fazzio, is about to take a fall after his investigation into the murder of a local community activist turns violent and leaves an invaluable witness dead.